By way of application only, the winners were selected on the basis of business production, longevity in the business, professional association involvement, and community involvement. 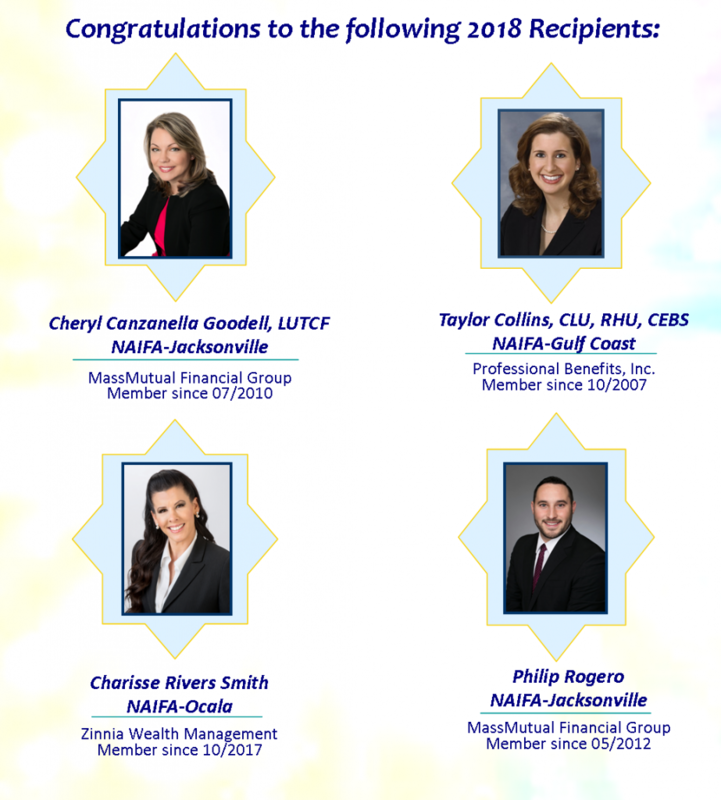 As the premier professional association in Florida for insurance and financial advisors, NAIFA-Florida each year is proud to recognize the success of young advisors in our industry. This award recognizes excellence and achievement in the Insurance and Financial Services field by measuring business production, longevity in the business, professional association involvement and community involvement for professionals 40 years of age and younger. Candidates will consist of insurance and financial professionals throughout the state of Florida, and final recipients will be chosen by a panel of NAIFA-Florida Board of Directors members. The award will be based on an advisor’s 2016 commissions, NAIFA involvement, community involvement, and volunteer efforts in other organizations. For individual advisors, this program presents an opportunity to be recognized for their efforts. If you are a manager, or otherwise oversee advisors, this program provides a recognition opportunity to motivate other young producers to reach their maximum performance potential! Check back for the 2018 Nomination Form! During a NAIFA-Jacksonville Panel of Peers, recognizing a few of last year’s award winners, we interviewed Jeremy Pratchard. See how this award has directly impacted his career and see how he fired up his mentor, Paul Broome! Thank you for your support in helping to recognize the top performers in our industry!